*Regular nightly rate is $209. Weekly rate is stay for 7, pay for 6. Your reservation total will include a cleaning fee and bed tax in addition to the rental rate. 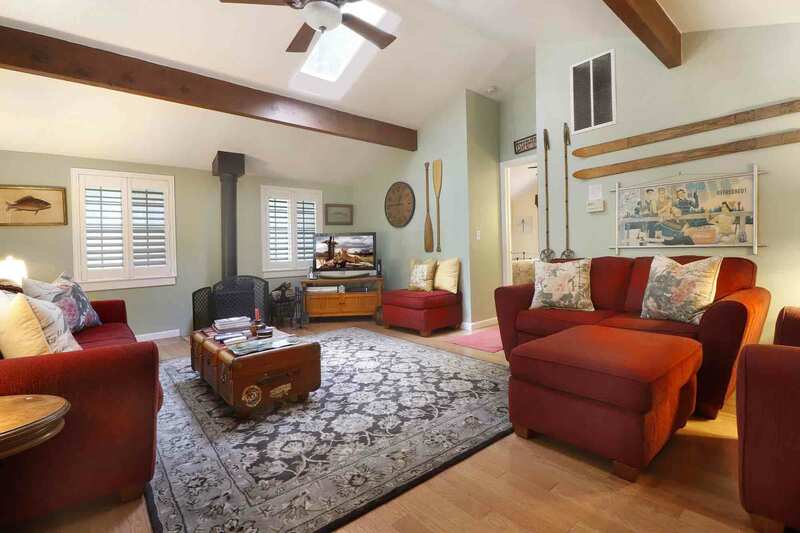 Creekfront Dream Cottage, Beautifully Remodeled, Deck with Creek View, Great Creek Access, Fenced Yard, Hot Tub, Firepit; Woodstove, Central Heat; Walk to Downtown Guerneville, River Beaches, and Local Favorite Garden Grill; Short Drive to Hiking, Golf, Wine Tasting, Coast. Wi-Fi. Keyless Entry; Unlimited Domestic Long Distance. Your Well-Behaved Dog is Welcome! Up the front steps, the master suite, with its own full bath and deck access, is just off the living room. The adjacent dining area opens to the kitchen. Beyond, there's a short hall leading to the other bedroom, a hall bath, and the rear deck, outdoor dining, landscaped, fenced yard, hot tub. There's a gate from the yard and a short path to Hulbert Creek. House is approx. 1050sf. Ceiling Fans (living room, master). NO A/C. "We had a lovely stay"
We had a lovely stay. Great backyard, hot tub. Great layout of the house for two couples. Bedrooms and bathrooms are separated. This house is fantastic for a getaway to lounge around and enjoy the company of friends and family. The backyard has an amazing set up to grill and hang out (with a hot tub, lounge chairs, and tables). My friends and I were so bummed we couldn't enjoy it as much, because it was raining during our entire stay. The kitchen is stocked with all the necessary amenities to cook a few meals, and check-in instructions are clear and simple. Easy checkin, great communication, we had a wonderful time and thanks for the wine! "We were absolutely not disappointed." 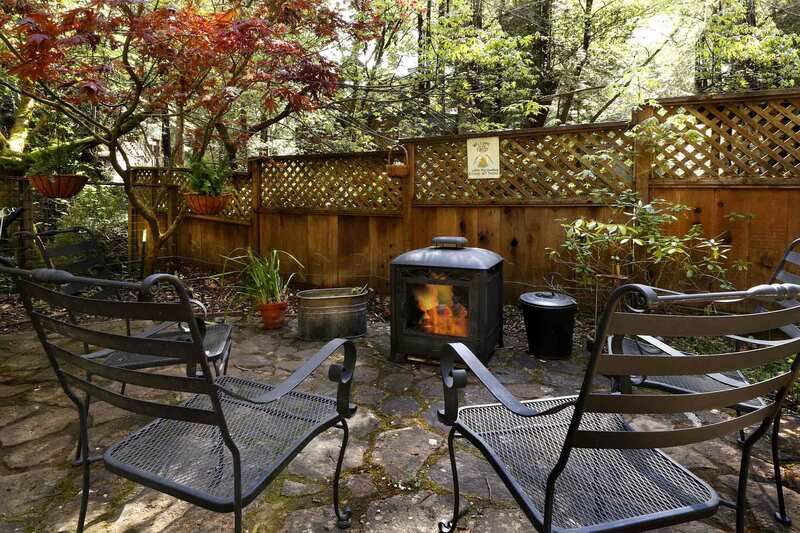 We came to just get away and enjoy the coast and the beautiful area of Guerneville. We were absolutely not disappointed. This was one of the best places we've ever stayed. Very nice amenities. Specifically, the bed was amazingly comfortable and a king bed (which is usually not found in most Airbnb's). The hottub did not disappoint. The amenities in the kitchen were good quality and easy to use. The fireplace was small but nice for the home. If you go, make sure you get logs that are no wider than 15" as many of the logs we had wouldn't fit the fireplace. If it's summer, you can use the larger logs in the firepit out back. The areas to lounge out back were plentiful, although we didn't use them due to the time of the year. It was conveniently located close to the coast as well as the downtown area. Very easy to get in and get out. Finally, the check out instructions were easy to follow and easy for the guest to execute as well. If and when we get back to CA, we would definitely stay here again. "fireplace was a nice touch!" Stayed for 3 days and 2 nights it was super clean has a nice little creek flowing behind the back. Also the little fireplace was a nice touch! "Such a beautiful place! " Such a beautiful place! Had everything we needed and more. The backyard was amazing, so much seating and a great place to have my morning coffee. Close to restaurants and the store. Quick responses from our host and friendly neighbors. Would definitely go back.
" Highly recommend- great location and a fun place." Our visit to Cherry Creek was wonderful. The place is cozy and had everything we needed for a perfect stay. The backyard was really the highlight with a hot tub and fire pit. The place was clean and comfortable for the four of us. We happened to be there on some particularly cold nights, and the insulation had a little trouble keeping up with heater. The wood stove was perfect for warming up though. Bring a duraflame log or two in the winter! Highly recommend- great location and a fun place. What a neat place. 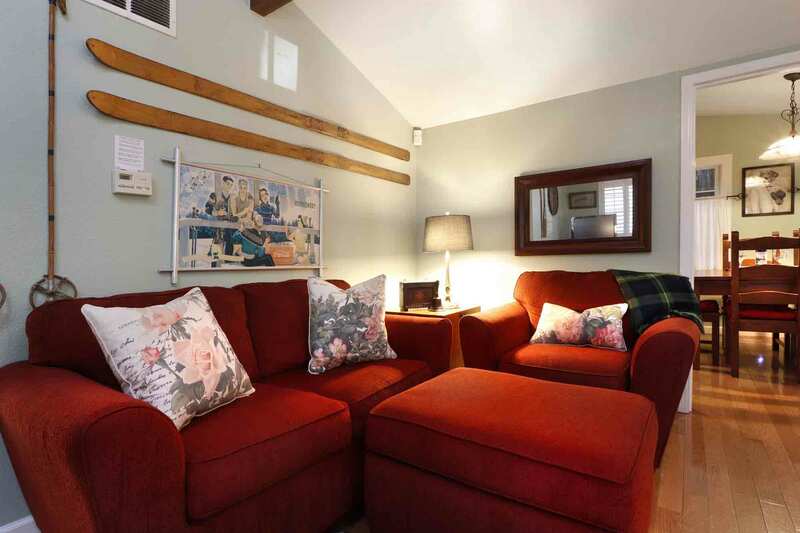 Secluded, quiet and comfortable for 2 couples to enjoy some privacy and relax. We loved this space! Very cozy, clean, and had all the amenities you could ask for. The creek was dry, but the back patio and trees totally make up for it! It was just as described and the neighbors were very friendly! Squeaky clean and had everything we needed. Creek was dry this time of year, but we enjoyed the outdoor space nonetheless. Peaceful location. We would be happy to return and highly recommend this house. An ideal spot for a quiet getaway nestled in the heart of some impressive redwoods -- we found that even if the day gets hot, the shade situation produced by said redwoods is such that the house doesn't get particularly warm inside, which is a nice bonus. Overall A+, would recommend/stay again for sure! "If you’re looking for a place to relax & get away, this place is it." Our family just stayed for Labor Day weekend. We were in town for our nieces wedding & needed a house to accommodate our small family & this house was it! Our favorite part was the back deck & backyard. We made it a point to be out there every chance we got. The host was awesome, and left us a welcome bottle of wine, which we enjoyed. I honestly have nothing negative to say about this house. If you’re looking for a place to relax & get away, this place is it. "We had a wonderful 4 day stay"
We had a wonderful 4 day stay. This cabin had everything we needed and more. The hot tub was especially nice in the evening. We will definitely return and stay here again! "Beautiful house in the redwoods." Beautiful house in the redwoods. We had a lovely stay, everything was great! Really liked the location and the surrounding area. The back deck and yard were great places to relax. "A lovely spot to relax and reconnect"
We found the property to be exactly as advertised, very comfortable and relaxing. The kitchen is VERY well stocked, everything was in good working order. Thank you! This house is really warm and inviting. I felt at home. 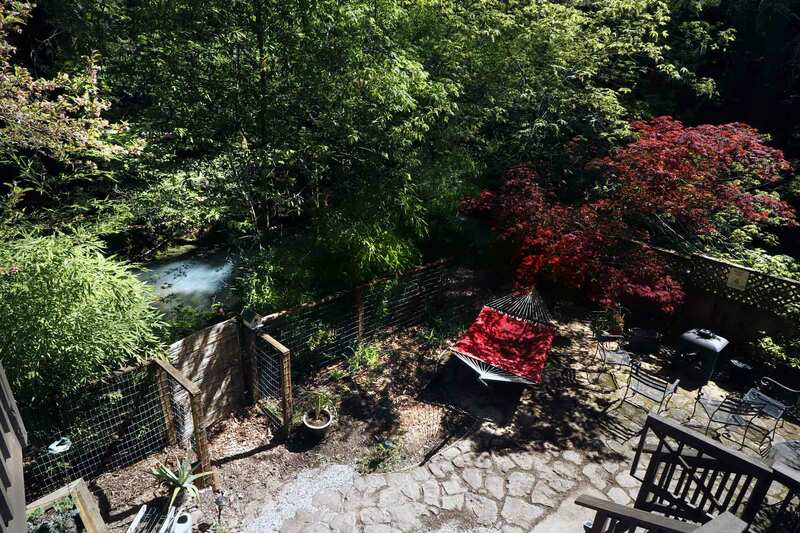 I love the deck, the well stocked kitchen, the comfortable memory foam bed, the sliding glass door off the master to the deck, the yard, the access to the creek, and the stunning fairy ring of redwoods in the front yard. I LOVE THIS HOME! The only bummer part is that the back of the house is across the way from Old Cazadero road so quite a few of cars go by. You can also hear everyone from surrounding homes and across the creek. So the outside isn't super quite but it is endearing. "Cozy and comfortable in the redwoods." Very comfortable for 2 couples. We'll kept. Comfortable outside decks. Would recommend and return. 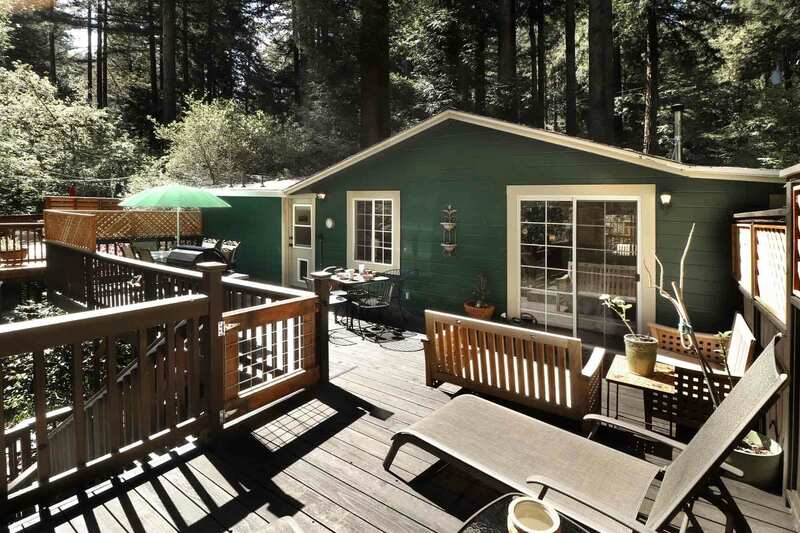 My family and I had an incredible stay in Guerneville. I’ve had wonderful experiences with River Getaways in the past and this stay was equally as great! 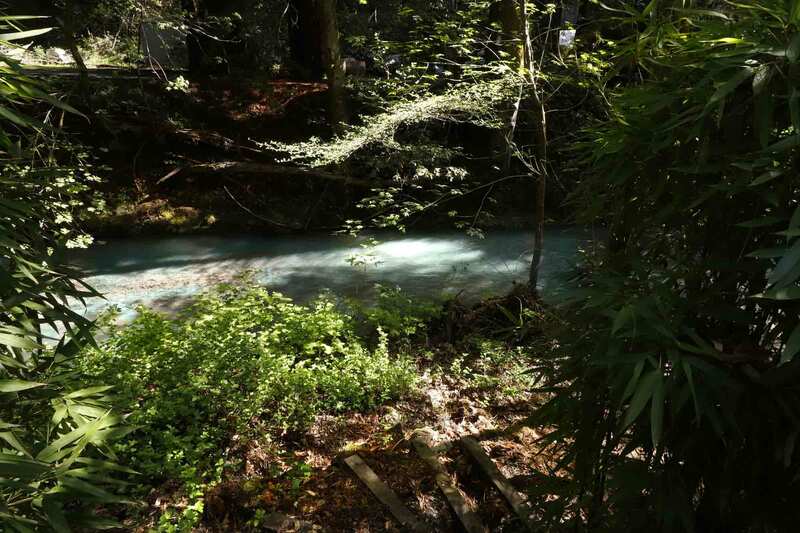 "Beautiful space with a flowing creek"
Beautiful space with a flowing creek. It was so peaceful, and we enjoyed soaking in the hottub while listening to the creek babbling. I have pet allergies so was a little worried about the space being open to dogs. There was a fair bit of pet hair on the couches and carpet, but as long as I put a blanket or something down before sitting, it didn't bother me. If you are hyper sensitive, it might not be the best choice, but I am fairly allergic and it was fine for me. Overall it was a perfect spot for us. Peaceful retreat with all the amenities. This place is well kept, and the property management staff are very nice. The kitchen had more amenities than I thought it would. That was a nice surprise! 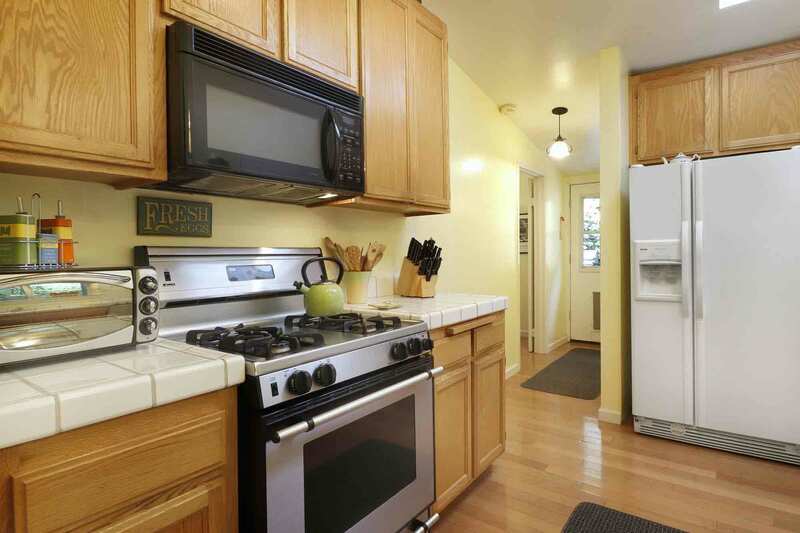 It's a comfortable home for relaxing and cooking, which worked for us! "Great place with everything you need!" 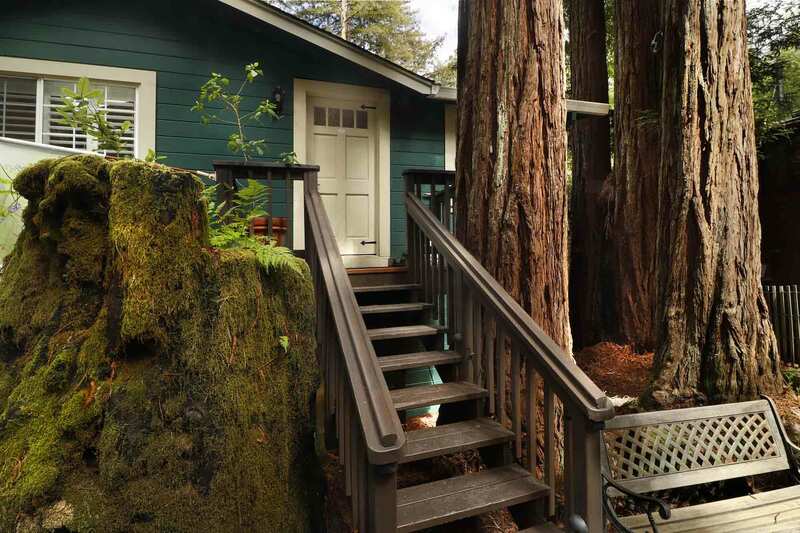 This is a beautiful little house in a lovely neighborhood, surrounded by redwoods. Kitchen had everything we needed to cook (plus a good coffeemaker and grinder), the outdoor grill was great, as was the living room, wifi, tv, bedrooms, - everything was really nicely appointed and the place was spotless. The backyard and deck area were wonderful and the hammock and hot tub were awesome, too. Perfect place, if you're not particular about bed comfort. This is a very nice home with good sized rooms, all very clean; and a well stocked kitchen as far as tableware and cooking utensils. We especially enjoyed the large deck with lounge chairs, and the opportunity to grill and eat outside in a lovely setting. We purchased groceries at the Safeway in Guerneville and cooked and ate all our meals at the house. We took daily excursions for wine tasting and coastal drives to Jenner and Fort Ross. "This house was a fantastic place..."
This house was a fantastic place to make home base in wine country. The patio in the back was perfect for relaxing - hammock, hot tub, lots of chairs in the morning sun. The couches are comfortable and can easily seat many people and the dining room table is also a nice, central perk near the kitchen. Quiet neighborhood with easy access. "A well organized place with a soul"
We really enjoyed our stay! The house is very clean, well organized, and the area is beautiful with town shops not next door, but easily reachable by car. We vacationed in other houses before and sometimes even when there is nothing formal to complain about there is just something intangible missing. Not in this case. This Russian River Getaway has not just all the items one could need, it also has a soul. Thanks! 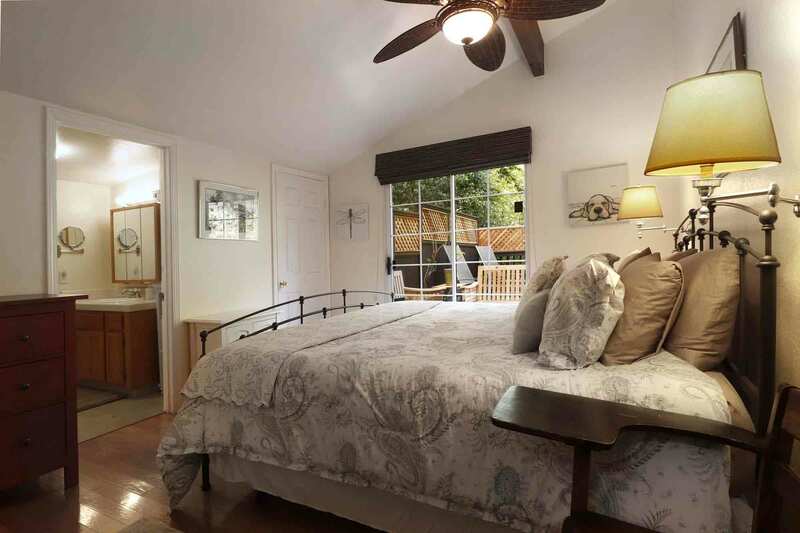 A very comfortable, clean, and convenient place to stay while enjoying the wonderful Sonoma County. 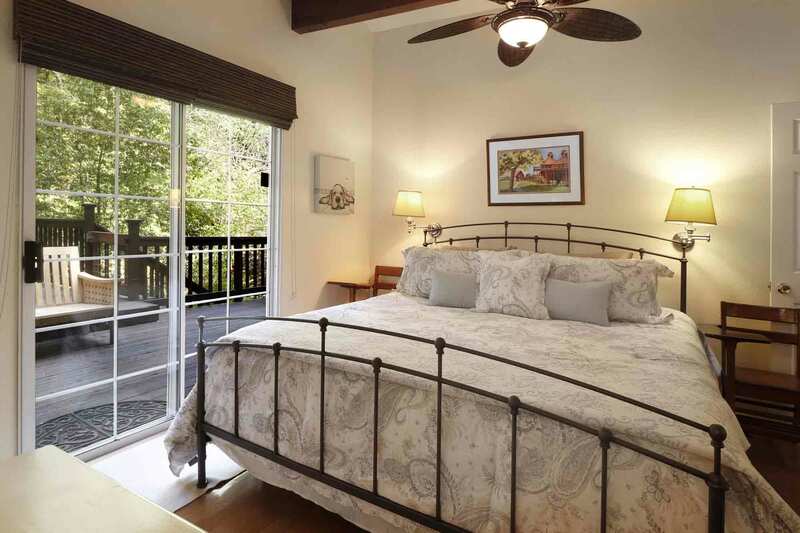 Convenient to the coast, Armstrong Redwoods, good restaurants, wine country, and the convenience of nearby Guerneville. Beds were quite good, and furniture comfortable. 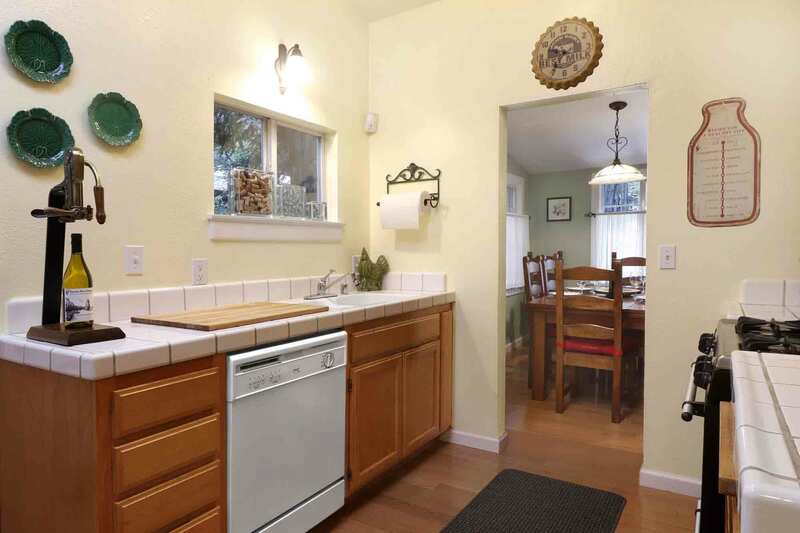 Nice useable kitchen and dining room. Very nice for two couples or a small family. The wood stove is appealing, but borderline small--difficult to keep a good fire going in it. Overall, though, a terrific place to stay. We enjoyed dinner at the Backyard in Forestville. 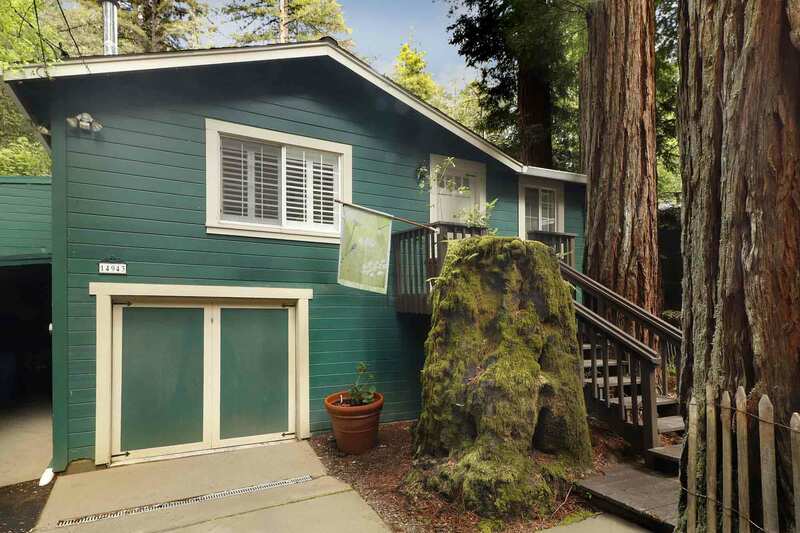 The house is up a long and winding road, surrounded by gorgeous redwood trees. If privacy is what you desire, this is not your house; but if comfort and quiet is on your agenda, stay at Cherry Creek. 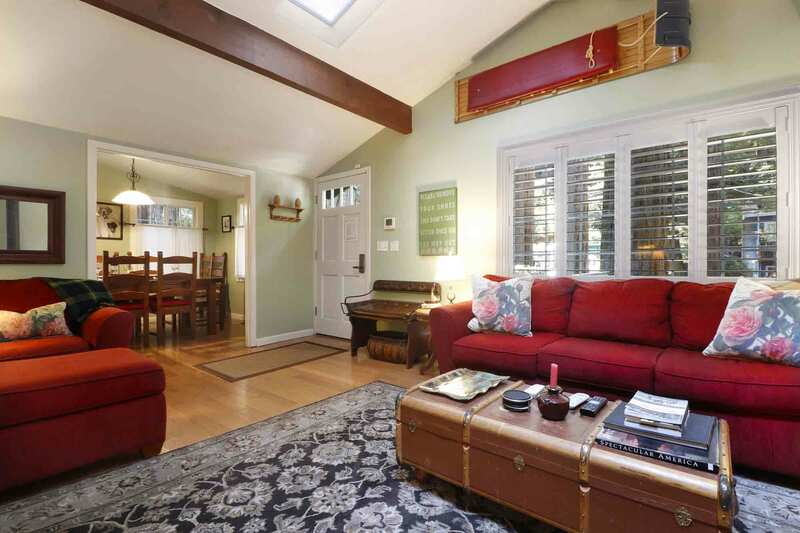 The location, once you make your way up the road, offers a serene house right on the creek. The family/living rm area is very comfortable with lots of seatîng. An area rug would add a nice touch and warmth in the cooler months. 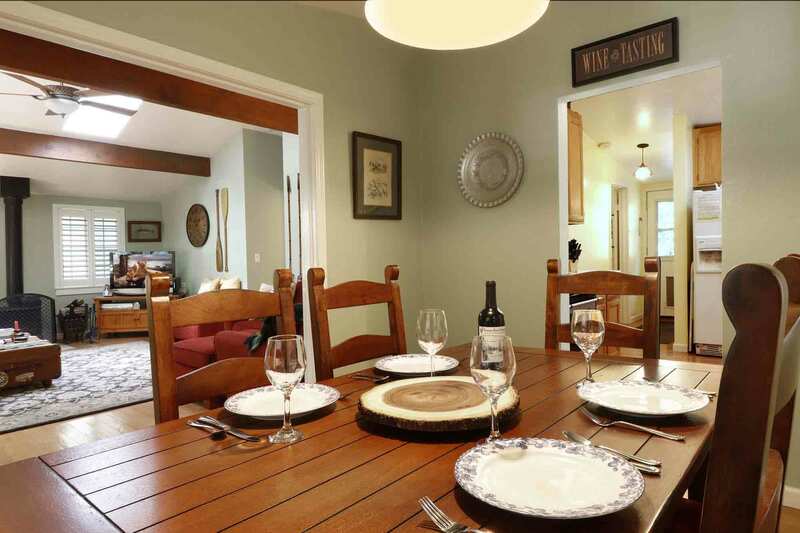 A large table in the dining room gives plenty of room to enjoy a meal or play a game. The kitchen is well equipped, but we did bring our own spices and olive oil. The house is dog friendly which is a huge plus, but lighting in the yard is non-existent, at least in winter months when solar lighting is not happening. 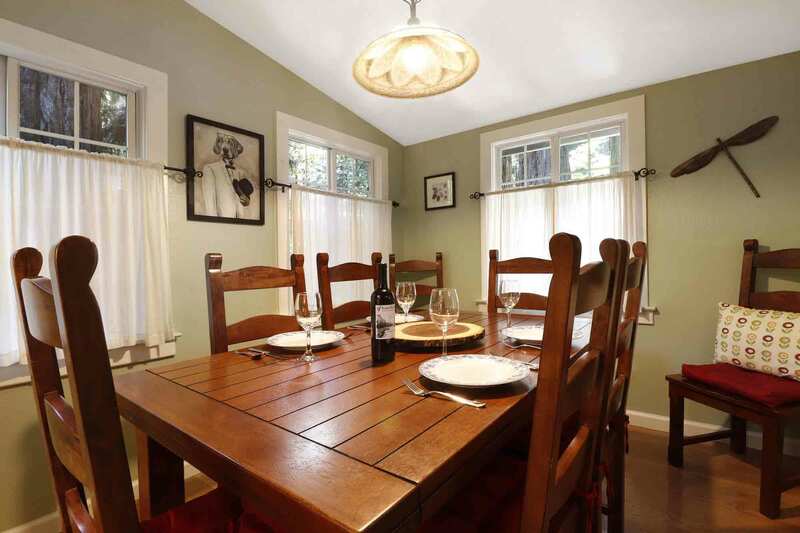 House is just minutes from downtown Geurneville and very close to all local sites ( wineries, coast,etc). Good for friends/ couples traveling together. A starter selection of wood would be nice for the first night. Bring a supply of throw blankets for cuddling in the evening as none were supplied. We would stay here again. Overall, very comfortable and clean. Of all the places where we have vacationed in, this by far, has been the one having the most amenities, the cleanest, the best. Loved it! The owners of this place really show pride in their property and in providing a quality place for their guests. We can't wait to come back! 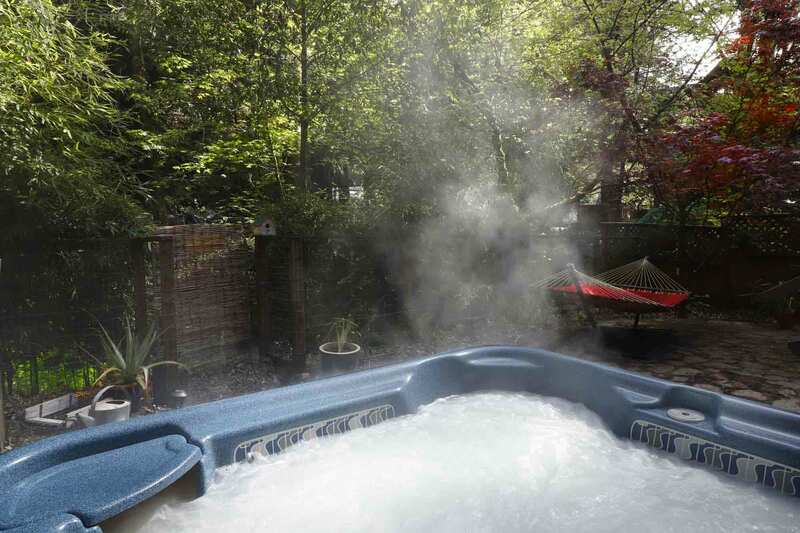 The property is not far from the main highway, close to town, and yet, private enough to enjoy an evening in the hot-tub or just sitting on the deck. I have to share that the friends that we were with had a 8 month baby with them; this baby was allowed to crawl in the living room area because it was THAT CLEAN! I am very thankful for having found this place! This house was so charming, nestled in the Redwoods. The beds were not the most comfortable, but the house and yard were great! Very nice house for vacation rental. I wanted to get out of the heat and this was much closer to Guerneville/residential area than I had originally thought. It dropped nearly 15 degrees when I drove to coast, about 10 miles away. I probably won't rent this one again simply based on location, but the rental itself was great. I honestly don't want to write an honest review about this place because I don't want competition when I want to stay here. I want it all to myself!!! The creek, the deck, the trees!!! All amazing. The kitchen is well appointed and the house is well stocked. The neighborhood is quiet and just perfectly placed far enough away from town but close enough. Perfection! We thoroughly enjoyed our week at the Cherry Creek home. It was very quite, peaceful, and just as described. The hot tub was very relaxing to use every evening under the stars. 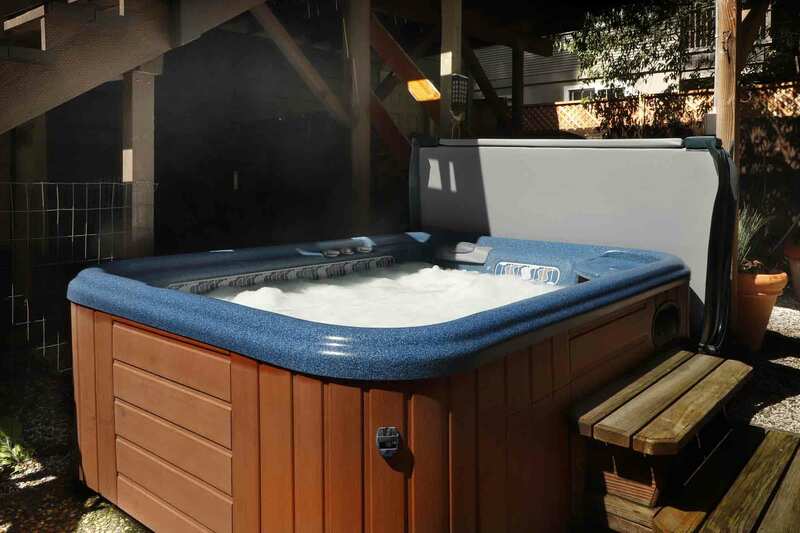 Keyless entry makes arrival a breeze, the wood stove and hot tub were great. Cherry creek is a wonderful place to stay. We could walk to the river and town. The hot tub was heated and ready for us to soak in. The home is large enough for a family (or two). It is clean and convenient to the greater bay area. I will be back! "Great place to stay with family or as a couple!" 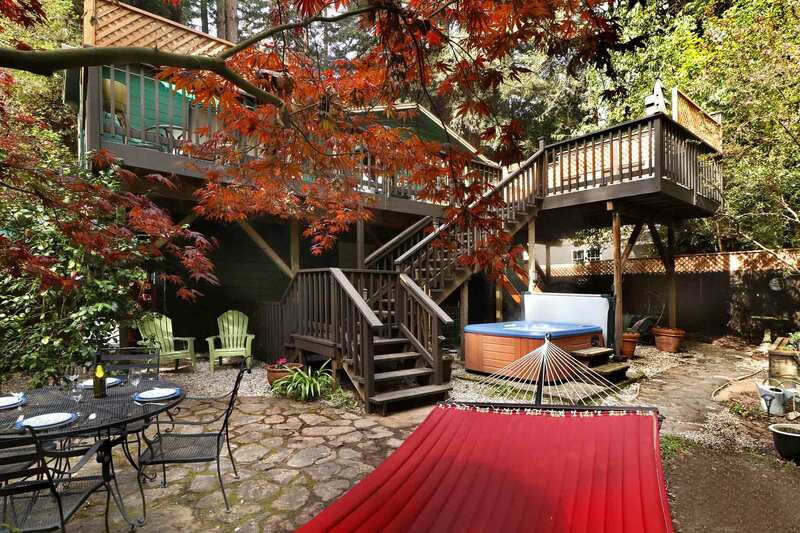 What a lovely place to stay in Guerneville! 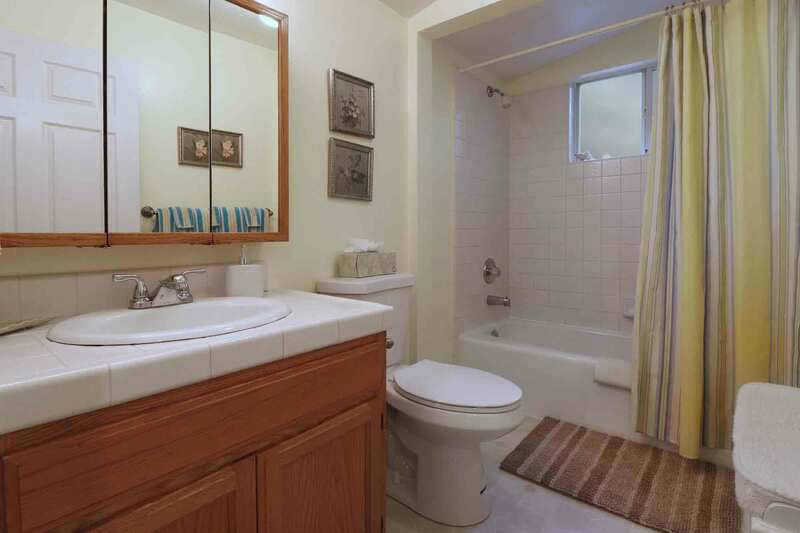 Close to town, walking distance to the river and a lovely creek right outside the back! 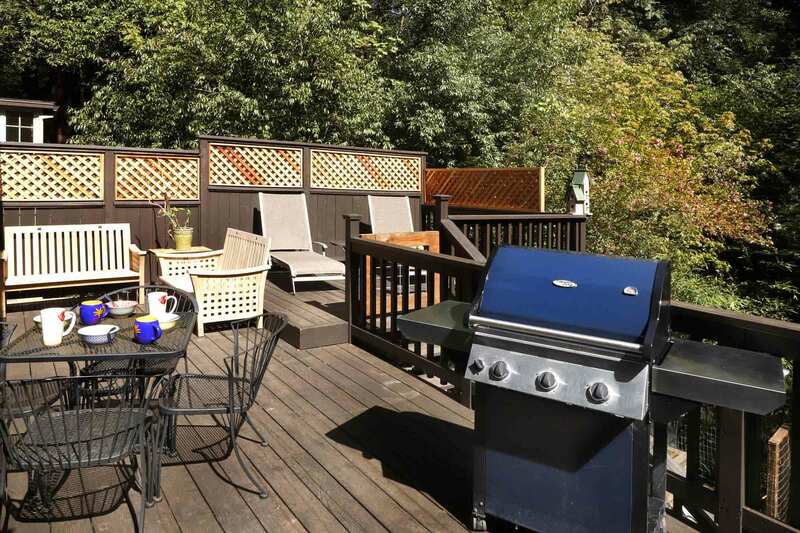 I think my favorite part was the fantastic deck and the beautiful trees surrounding the home. Wish I had more time to hang out in the hot tub. 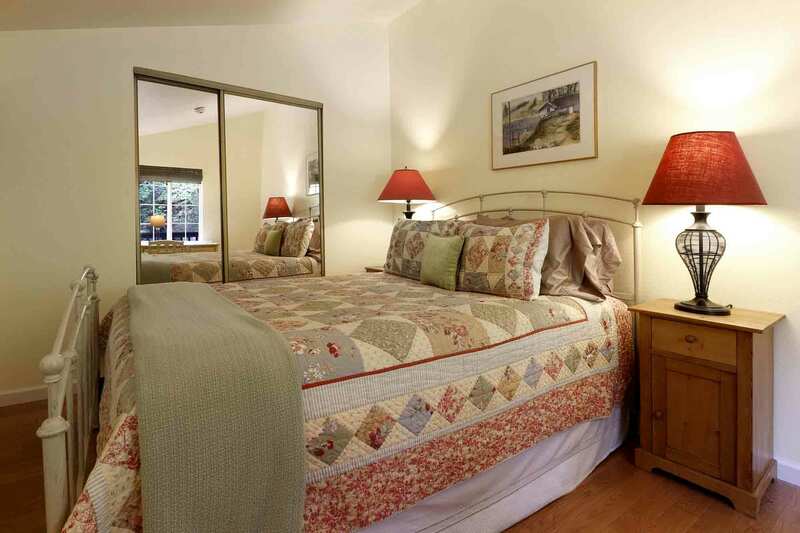 Great bedrooms, comfortable living room, and plenty of space to enjoy the house.